This will reset all settings. This will not delete any data. If you’ve got 16GB of music, videos and photos, this option won’t remove it. 3. Select Reset All Settings > Tap button to Reset All Settings > Tap Button Again to continue. Apple makes you click through twice, to be sure that you really, truly mean it. When you complete the process, your iPhone will reboot. Despite the scary two step warning, this doesn’t affect your data. All of your email accounts will remain in tact, as well as any SMS text or iMessages.What this effectively does is to reset some of your Settings to factory default. It’s not a complete removal of settings. It removes all of your preferences for Wi-Fi, Bluetooth, Do No Disturb, Notifications, General, Sounds, Brightness & Wallpaper and Privacy.Resetting the iPad’s settings doesn’t erase any of your data or media. The only downside is that you may have to go back and change some settings afterward — so you can try this step without trepidation. 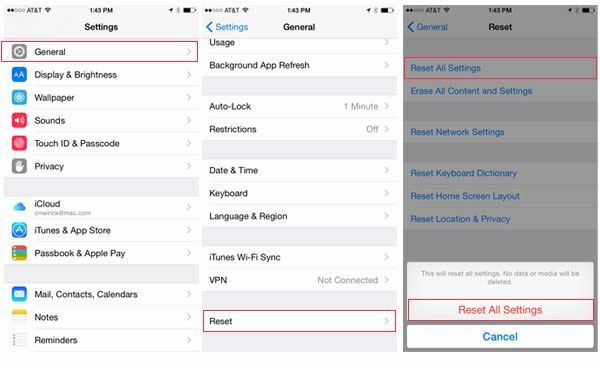 To reset your settings, tap the Settings icon on your Home screen and then tap General→Reset→Reset All Settings. Be careful not to tap Erase All Content and Settings, at least not yet. Erasing all content takes more time to recover from (because your next sync takes a long time), so try Reset All Settings first. If this solves your iPad's problems, great, you don't need to take more drastic measures.